This blog entry is part of my page about the Geneva watch case making company of François Borgel. Mount Everest was identified as the highest mountain in the world in 1856 by the Great Trigonometric Survey of British India. The first European to make a substantial climb of the mountain, to nearly 23,000 feet, was George Mallory during the first expedition in 1921. It was an exploratory expedition not equipped for a serious attempt, but Mallory discovered a promising route to the top via a northern approach. Mallory returned in 1922 for an unsuccessful attempt to climb the mountain and then again in 1924 for a third attempt. George Mallory was born in Mobberley, Cheshire, just a few miles from where I live. He was a keen mountaineer from an early age after being introduced to climbing in the Alps by one of his masters at Winchester College. Once when asked why he wanted to climb Mount Everest Mallory is said to have replied Because it’s there; a pithy reply that became the most famous phrase in mountaineering. The story of the Everest expedition was closely followed by the public with regular dispatches published in The Times. Shortly before his final climb Mallory wrote The third time we walk up East Rongbuk Glacier will be the last, for better or worse ... We expect no mercy from Everest. At age 37 Mallory was aware that there would be no chance of him joining another expedition to Everest in the future. The third attempt on the summit was the last of the expedition, and Mallory's last chance to conquer Everest. If he got within striking distance of the summit he would have pushed on under any circumstances. Analysis of the chronology of events and the equipment used by Mallory and Irvine indicates that they probably got very close to the summit, and knowing it was their last opportunity, they may have pushed on for the summit late in the day. This would have meant descending in dusk or dark conditions, which Mallory had done on Alpine expeditions, but which was much more dangerous high on Everest. Given Mallory's determination to summit Everest and knowing that this was his last chance, it seems likely that they did press on to the summit, and then in attempting to descend in the dark they fell, with tragic consequences. A tribute in The Times after the news had reached London said Mount Everest has taken one of the finest mountaineers that this or any other generation has produced. The deaths of Mallory and Irvine were regarded as a national tragedy at the time, and the mystery of whether they achieved the summit has caused much speculation and discussion. Many books and articles have been written on the subject, and interest continues to this day. The 1924 expedition left Darjeeling at the end of March, trekking overland and reaching their base camp location at the end of April. Setting up the higher camps and stocking them with supplies and equipment took up May. Two attempts on the summit were planned. The first attempt, without the use of supplementary oxygen, was made by George Mallory and C. Geoffrey Bruce on 1 June, but was driven back by harsh icy winds. A second attempt was started on June 2 by Edward F. Norton and Dr. T. Howard Somervell. Also climbing without oxygen, they were overcome by fatigue before they reached the summit. On June 8, 1924, George Mallory and Andrew Irvine made a third, previously unplanned, attempt on the summit, this time using supplementary oxygen. They never returned. They were seen briefly through a break in the clouds by another member of the expedition, Noel Odell, who said they were only a few hundred feet below the summit. There has been intense speculation in the mountaineering community as to whether Mallory and Irvine actually reached the summit, 29 years before Sir Edmund Hillary and Tenzing Norgay did in 1953. On this expedition Mallory wore the Borgel wristwatch shown here. 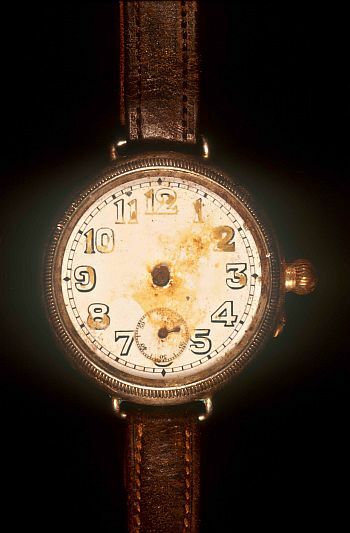 The watch was found on his body when it was discovered in 1999. It was missing its crystal and was found in a pocket of Mallory’s clothing. There has been speculation that the watch lost its crystal and stopped during a climbing manoeuvre, an arm jamb in a rock fissure while ascending the second step, and that the position of the hands could indicate the time at which the arm jamb took place. This theory was evidently proposed by someone who is not a watchmaker or watch repairer and knows little if anything about mechanical watches. There is not a trace of damage to the watch case or the fragile enamel dial, not even the faintest scratch or crack, that would suggest the watch had ever even been in contact with any rock. Any watchmaker or watch repairer would know this just from looking at the pictures of the watch, and would know that any suggestion that the watch was stopped as a result of being jambed between two rocks is patently ridiculous. I have no hesitation in saying that the complete absence of any relevant damage to the watch means the theory is simply and completely wrong. The watch has a high grade movement in a silver Borgel case. This would have been an expensive watch when it was purchased by Mallory. The suggestion that he would knowingly have jammed his arm into a rock fissure while wearing it, when he would surely have known that such a manoeuvre would damage the watch, seems ridiculous. People knew that watches were delicate precision instruments and treated them with respect. Today watches are more robust, with steel cases and shock protection, but even one of today's tougher watches would be seriously damaged by being jammed between two pieces of rock. I don't believe that Mallory would do it. If he was going to do an arm jamb, he would have first taken off his watch and put it in his pocket. The watch when found was missing its crystal, the clear front that protects the hands and dial, and the delicate tracery of the skeletonised luminised hands had rusted away leaving only stumps of the hands on the central bosses. These stumps are not visible in the picture because they disintegrated when the watch was subsequently being examined. Apart from the missing crystal and rusted hands there is no other damage to the watch. There are no marks on the silver case, on the bezel, or on the fragile enamel dial. In fact, there are no signs that the watch has even been brushed lightly against a rock, let alone crushed between two rocks during a hand jam. If the crystal had been broken as a result of the watch being crushed between Mallory's arm and a rock, then the fragile enamel dial, which is a thin disc of copper coated with an even thinner layer of white glass enamel, would show signs of this; they crack very easily. But in fact the dial of Mallory's watch is perfect and has no cracks. The most likely course of events is that first the crystal was lost, that it either fell out or was knocked out. It could have been knocked out by a small impact that snapped it out of the bezel. This is quite easy if caught at just the wrong angle, but the lack of any damage to the bezel makes this unlikely. Or it could be that it was an “unbreakable” plastic crystal and the intense cold at high altitude caused it to shrink and simply drop out, a known problem with early plastic crystals. When Mallory noticed that the crystal was missing he would have removed the watch from his wrist and put it in his pocket to protect it. Once in his pocket, without the crystal to protect them, the hands would have come into contact with things in the pocket and this would have stopped the watch. All watchmakers and watch repairers know that if the hands of a watch touch either each other or the dial or the crystal, even lightly, the watch will stop. But otherwise it is actually very difficult to stop a watch that is running well. This requires either breaking the delicate pivots of the balance staff, or beating the watch flat with a hammer. The suggestion that an arm jamb manoeuvre could have stopped Mallory's watch without breaking the balance staff pivots or damaging the case or dial is ridiculous. An x-ray of the watch showed that the main spring was not fully wound down when the watch was discovered, which is thought to add weight to the theory that the watch stopped as a result of some event. 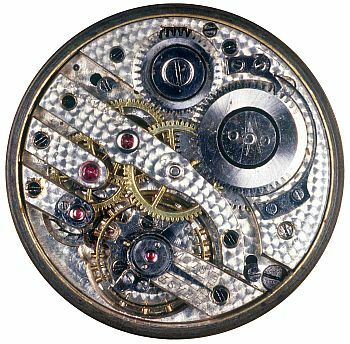 However, it is most likely that the watch stopped before the spring was fully unwound because the hands became entangled with something in Mallory's pocket, or the material of the pocket itself, or were bent and touched each other. The watch, now in the keeping of the Royal Geographical Society in London, is a typical Borgel wristwatch of the period, the dust proof screw case invented by François Borgel of Geneva, patented in Switzerland in 1891. These were the best wristwatches for demanding conditions that were generally available at the time. They were more expensive than watches with the normal style of hinged case and had been especially favoured by officers during the Great War for the difficult conditions in the trenches, so it is no wonder that one found its way onto George Mallory's wrist. The watch case is silver, with London import hallmarks including the date letter “u” for the hallmarking year 1915/1916. The sponsor’s mark is GS, showing that it was imported by the company of George Stockwell. The dial and hands originally had radium based luminous paint to illuminate the hands and numerals in the dark. This appears to have come off or moved about during the years on the mountain; you can see how the remaining paint follows the outlines of some of the numerals, particularly the "2" and the "1" but also on the "8," "9," and "12". The brown staining on the dial is probably traces of this paint, and also the parts of the hands that rusted away. It is notable that although the hands were rusted away there was no noticeable rusting of the movement under the dial, the amount of moisture affecting the watch must have been very small. The splines on the "onion" crown are very well worn, indicating that the watch had been well used; being a manually wound watch it would have to be wound by this crown every day to keep it going. The watch is remarkably undamaged considering its history, and it is reported that when the hand stubs were removed during its examination it started ticking. The movement is a typical high quality Swiss movement of the period, with a straight line lever escapement, bimetallic temperature compensated balance and 17 jewels, cap jewels for the escape wheel pivots increasing the more normal count of 15 jewels by two. It is nicely finished with perlage (engine turning) to the plates. It was made by the Swiss Fontainemelon ébauche factory. Further details of the movement of Mallory's watch can be seen on my Movement Identification page. In spite of the fact that both Sir Edmond Hillary and Tenzing Norgay wore Smiths Deluxe watches on the successful 1953 attempt on the Everest Summit, sponsored by Smiths and led by John Hunt, and that Norgay also wore a Rolex watch that had been issued to him on the unsuccessful 1952 Swiss expedition led by Raymond Lambert, which got to within 200 metres of the summit before turning back, leading to conflicting and confusing claims ever since, it seems likely that the first watch carried to the summit of Everest was George Mallory's Borgel wristwatch.